I finally pulled out my ice cream maker to celebrate National Ice Cream Month! My inspiration for this ice cream comes from FLIP Burger Boutique here in Birmingham. FLIP has great burgers but even better milkshakes! The first milkshake we tried at FLIP was the Krispy Kreme milkshake and it was heaven! 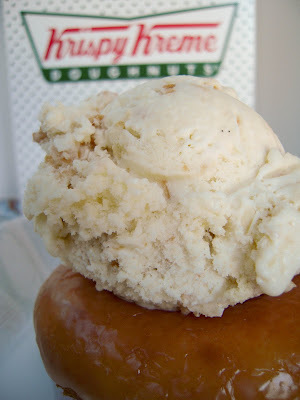 I knew right then and there that I would be making Krispy Kreme ice cream at home. I used a vanilla ice cream for the base and stirred in chopped doughnuts. The results were amazing! 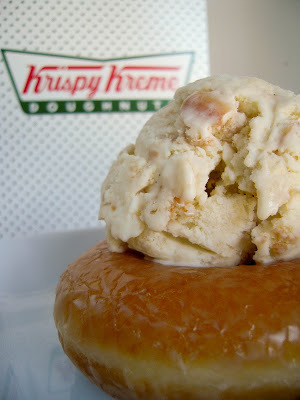 I don't how you could go wrong with ice cream and Krispy Kreme doughnuts! 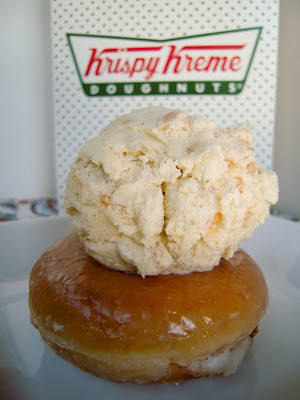 SO, what are you waiting for - run out and get some Krispy Kreme's and make this ice cream ASAP! Whisk together first 3 ingredients in a large heavy saucepan. Gradually whisk in milk and cream. Cook over medium heat, stirring constantly, 10 to 12 minutes or until mixture thickens slightly. Remove from heat. Whisk egg yolk until slightly thickened. Gradually whisk about 1 cup hot cream mixture into yolk. Add yolk mixture to remaining cream mixture, whisking constantly. Whisk in vanilla bean paste. Cool 1 hour, stirring occasionally. Place plastic wrap directly on cream mixture, and chill 8 to 24 hours. Chop Krispy Kreme doughnuts into small pieces. Stir 1/4 of the chopped doughnuts into the cream mixture. Pour mixture into freezer container of a 1 1/2-qt. electric ice-cream maker, and freeze according to manufacturer's instructions. Once the ice cream is set, stir in remaining Krispy Kreme doughnuts and put in freezer to harden. I luv KK donuts. So I imagine that KK ice cream would hit the spot very well! YUM! You never cease to amaze me. Oh, my goodness! That's insane! I am now on a mission to find me some Krispy Kremes. Hey, thanks for sharing!!!! OMG! My husband would LOVE this ice cream. He is a donut freak and a krispy kreme is his favorite. I need to make this ice-cream! Holy cow, I just gained 10 pounds looking at this! YummO! What a great idea to use krispy kremes! I would eat so much of this!! This entry may not be such a good idea for a chick on a diet...but I sure did enjoy looking at it anyway! I'm a new follower (thanks to Katherine at Grass Stains) AND I have a new ice cream maker. Oh, boy, will it be getting a workout! Holy cow, what a yummy idea. I need to see where the nearest Krispy Kreme is to our new house! A long standing family tradition from my parents is to put vanilla ice cream in a stale doughnut and then drizzle it with Kahlua and chocolate syrup. It's really wonderful. Hope you don't mind, I shared this post on my blog yesterday! Love the idea:) So excited to try it!